This book can be read as a standalone mystery, but if you want to know more about the Westwick Witches and their family history, you can start with book 1: Witch You Well and book 2: Rags to Witches. "...A bewitching, supernatural treat**. 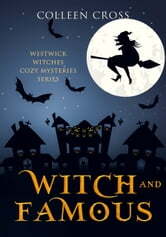 ** If you love witch cozy mysteries you'll love Cendrine West and her wacky witch family!" "...One of the best paranormal mystery books I've read in awhile. An imaginative detective mystery that combines the best mysteries of an Agatha Christie whodunit novel with a Harry Potter fantasy book, this is magic for grown-ups!" Witches who unlock mysteries, solve crime, and help those in need. They are collectively a kind of a witch of all trades, because pitching in--or is it witching in-- is what you do in a small town. Everyone helps out. Even Grandma Vi the ghost investigates and sleuths. But when everyone pulls together, it's not always in the same direction! If you like a good puzzle, a good laugh, and a good witch mystery series, you'll love these cozy mystery books! Available both as ebook cozy mystery books and cozy mystery paperbacks. I am writing the next book in this series of paranormal cozy mysteries, and as long readers like you enjoy these humorous cozy mysteries I will keep on writing them. Thanks for reading!